I have a cute 8 month horsfield tortoise the first time i put her in her well not a cage but a a very wide open cage she kinda looked at me like she was trying to say a little privacy please so before i left her i put in her bed some hay food and water and went downstairs she lives in my room .Well when i returned i saw she'd eaten all her food but pushed everything around and put her organic well pellety kind of things in the middle of the big cage thing but i couldnt see her i looked and looked until i heard some some rustling out of the organic pellets shed made an igloo type thing and was snuggled up in there . 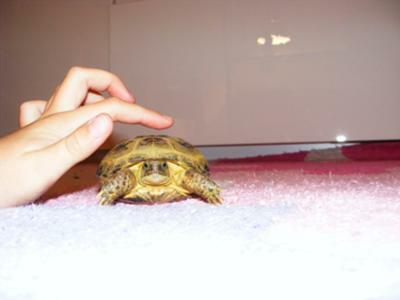 My tortoise Holly has a domed shell and is well looked after though she is very lazy i try to spend as much time with her as i can and i hope she likes me as her owner .My tortoise Holly is the best in the world! ps she also likes to dig a lot.